Be somebody or do something. That's the question. Am I selfish? Hard question… Before reading this book, I would have probably say no, but the sad truth is we are all selfish. And it is not good, at least, if we intend to reach your ambitions. 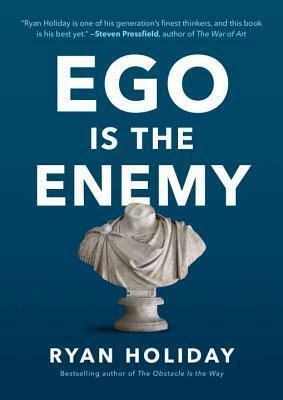 With Ego Is the Enemy, Ryan Holiday challenges the assumption we need confidence to achieve success. The road to success is never linear and ego could make you go out of the path. Based on examples from history (Belisarius, Genghis Khan), military (General Georges C. Marshall), politics (Benjamin Franklin, Angela Merkel, Churchill, Eleanor Roosevelt), sports (Bill Walsh, Frank Shamrock), business (Howard Hughes, John D. Rockefeller), filmmakers (Orson Welles), Ryan Holiday shows the problems of ego from other people’s experience. How some people was successful. How some people wasn’t. And how some people often fails after reaching the top. Every day of our life we find ourselves at one of three phases that represent the three part of the book: aspiration, success, failure. We will battle ego in each of them. This book help us be humble in our aspirations, gracious in our success, and resilient in our failures. Ego Is the Enemy is filled with many quotes and many interesting, various stories. That was a really pleasant reading. What I like the most about this book is that it forces me to reflect on my ambitions, while challenging my position on the subject. This is an optimist book. Ego is not some power you’re forced to satiate at every turn. It can be managed. It can be directed. I appraise the meticulous work of research the author did, reading an incredible number of biographies of famous people. Most of the content is not backed by solid research studies but the argumentation definitely works.